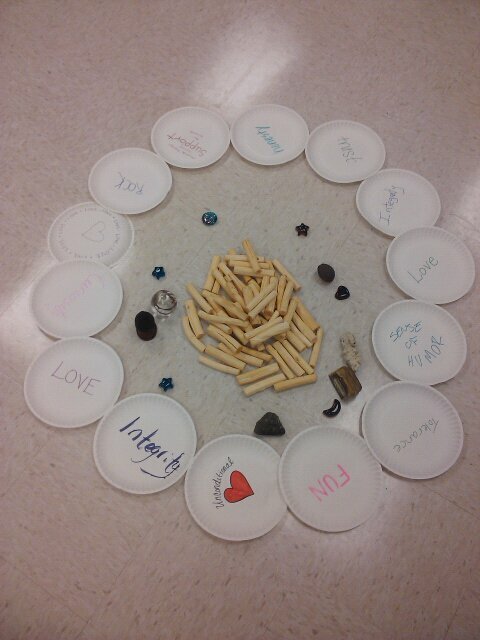 Circle Space Services - Starting Restorative Justice Circles by engaging values as guidelines. Starting Restorative Justice Circles by engaging values as guidelines. The basic foundation of positive relationships is to live in your best sense of relationship values. I use the word “sense” because I think this is a way to understand the spiritual sense of who we are as people. I believe we are all spiritual, emotional, mental and physical. By understanding our relationship to ourselves and others based on these four aspects of ourselves, we grow. My way of setting up Circles includes engaging people with values immediately. I get people arranged in Circle, and explain what Restorative Justice is, what constitutes a Circle (values, talking piece, open, close, confidentiality, taking turns, equality). The first thing after the selected reading is to ask people to join in creating our Center. I use a capital on Center, because the Center of a Circle, represents to me, being Centered in a good way. To operate with our focus on the collective instead of the individual. I say “this is a time to put WE ahead of ME”. The first step is to ask people to think of someone they are close to. This starts building our sense of community. As our brains bring up a memory of a family member or spouse, good feelings tend to wash over us. Flooding our brains with positive hormones (the physical aspects of you we are). I ask people to then select an important aspect of that relationship. This usually has people confused. We seldom express or talk about these aspects to our relationships. Values are our inner beliefs and ways of relating to others. We are often doing our values, but not expressly saying “this is me being _(value)_. I tend to repeat the directions, I try to get people to focus on a specific relationship rather than just a vague expression of what is important. By focusing on a specific person, when we share the values we can share a specific example and demonstrate what our values look like in action. The values are then placed in the Center, to create what the process will center around. I explain that if these are good values for our relationships outside of Circle, that we could bring them into this Circle. Depending on the sense I have of the emotional climate, or if I am waiting for people I might share a story or example. I point out that from middle school to prison, people express the same types of things being important (respect, honesty, love). The very next round is the first pass with the talking piece, and we share what we have put on the plates and place them in the Center. The next round is to ask people for a committment to honor these. Consensus is brought in, as we all agree or acknowledge that we will try to live by the values in the Center. I like doing it this way, asking people to think of those close to them, identifying the most important aspect. Acknowledging how our relationships contribute to us happens when people share what and why they put the value on the plate. It also saves time, if that is a concern. I have been in other Circles where the facilitator(s) had us identify other ‘guidelines’, and those are placed on the wall outside of the Circle. My experience our values in the Center, help enough to be grounded and let people express themselves with honesty, respect and others in the Center. 1.) think of someone you are close to. 2.) now consider what is the most important aspect to that relationship. What one thing makes it special? 3.) write that on the paper plate, not the person, but the word that is most important. ← Being forced to know how to spell “leukemia” is hurting my heart.